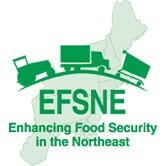 The market basket chosen for the Enhancing Food Security in the Northeast (EFSNE) project was one of its major tools, as its contents served as the subject of a variety of analyses across the research teams. The interdisciplinary systems project studied multiple components of food systems in the Northeast region. One of the team members’ first collaborative exercises was the choice of the eight items representing the major food groups, includ­ing different processed forms of food and healthier versions of several. This article summarizes the information gathered on the market basket items, including (1) some salient data describing the state of each food item’s industry; (2) the current regional-self-reliance production level; (3) consu­mer purchases of these items in the Northeast utilizing secondary data sources and data gathered in project intercept surveys; (4) store inventories, including prices and where the food is produced or manufactured; (5) the percentage of the market basket food that is produced regionally, as well as the regional economic value-added percentage; (6) models of six of the foods predicting the effect on production and supply chains of changes in the system, such as increased demand and environ­mental changes; and (7) foodprints for each food. Market baskets are frequently used instruments in food environment and cost studies. Using market baskets in EFSNE allowed the teams to aggregate and interconnect data from multiple analyses done by researchers from multiple disciplines to tell a rich story about a specific set of foods, their supply chains, and the future opportunities to enhance their production and distribution in the region.